Bespoke Air Charter takes an in depth look at large twin engine helicopters. 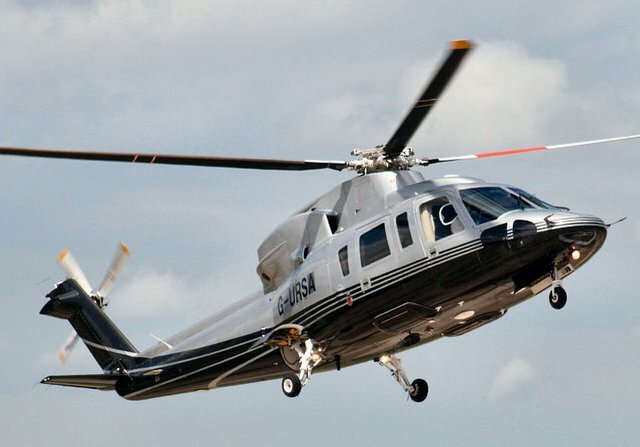 The Sikorsky S76 is an exceptionally smooth, quiet and comfortable helicopter for executive and VIP transport. The helicopter has an eight seat, air conditioned cabin and the minimal vibration and noise levels make the S76 one of the most popular large twin, VIP helicopters. The S76 helicopter cruises at 150 knots and can make the trip from London to Edinburgh, without refuelling, in under two hours. It is also the machine of choice for the Royal Flight, the helicopters used to transport the Queen and other members of the British Royal Family. The AS365 helicopter, and the newer EC155, are from the Dauphin family of helicopters, developed by Eurocopter, now Airbus Helcopters. The AS365 and EC155 are both multi-role helicopters and can be found operating offshore to oil rigs, and for both the police and emergency medical services. In its VIP, executive transport configuration the helicopter can carry up to 8 passengers. The helicopter offers a quick, smooth and quiet ride. It cruises at 150 knots and has a range of over 450nm. The Agusta 139 helicopter is a medium, twin engined helicopter with the most spacious cabin in its class. It cruises at over 150 knots and has a range of 500nm. Again, this machine is a multi role helicopter and used by many offshore oil companies. It has also recently been chosen as one of the helicopters to be used for the UK Search and Rescue fleet. The 139 helicopter is a twin crew, fully certified IFR helicopter with a four axis auto-pilot and full glass cockpit. It is one of the most comfortable and capable helicopters available to charter.